One of the most frequent tasks of an IT admin is resetting the user account passwords. This is a pretty simple and straightforward task, however if you’re managing hundreds of active users in your environment this might become a routine and time consuming process you’d want to optimize. 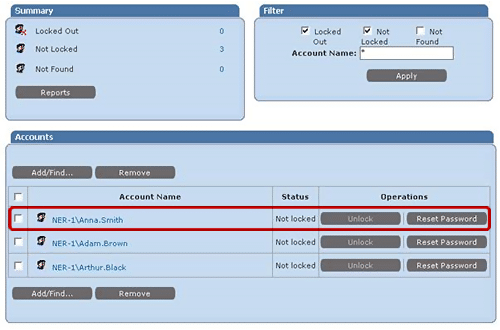 Launch the Help Desk Portal of the Netwrix Password Manager and search for the user you want to reset the password for. Once the user is found, you can reset the password and specify that you want the user change the passwords at next logon. 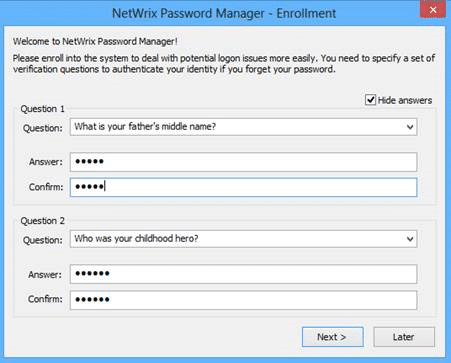 Netwrix Password Manager allows users to reset passwords themselves through the Self-Service portal. In order to have this ability the user must be enrolled into the application by completing the enrollment form that contains several identity verification questions. They will be asked when the user decides to rest the password. Once the form is completed the program confirms that the enrollment procedure has been finished successfully. Now the user can reset the password himself and also specify if the password needs to be changed at next logon. Alerting about account operations – e-mail alerts can be setup to notify administrators and end users about certain account operations, such as enrollments, password resets etc. Windows IT Pro Community Chooses Netwrix Auditor!